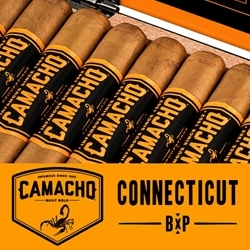 Each of these Camacho BXP Connecticut hand-rolled premium cigars are box-pressed and feature a perfect blend of Ecuadorian and Honduran tobacco fillers. The Gordo, Robusto and Toro cigar styles are individually bundled in a US Connecticut Shade wrapper that offers a maintenance free burn, with a crisp and easy draw. Another masterful recipe by the Camacho brand making this blend of premium cigar a unique and fuller flavored smoking experience. Smokers Discounts offers Camacho Connecticut BXP premium cigars in numerous varieties of sizes and flavors. Check out all the styles available here for a discount price! Call us for more details!